Quilt Market is right around the corner now, so I spent the weekend sewing. I am on a patchwork kick these days. Works nicely since I want to show as many of my new fabrics as possible in a small space. This way I get to play with them all at once! I'm getting pretty excited. I know not all the fabricnistas will be there in Pittsburgh, but I'm so looking forward to seeing many of you again. Let me know if you're going. My birthday was this last Friday. It was a wonderful day. The new fabrics were here, God stopped the rain just for me, the sun was shining, and I was surrounded by friends and family. Most of you do not know much about my life. That's probably good. But the older I get, the more I realize I'm not as alone as I thought in having a crazy, sad childhood. See, I was passed among different family members, foster homes and ultimately became a ward of the state while I was in high school. I was clearly unwanted, unloved and unloveable. My birthday was not celebrated. In fact, I did not know my actual birth date until I was an adult and got a copy of my birth certificate. April 17. Not the 15th or 13th as I thought. So you can imagine how tickled I am if I get so much as a birthday card. One of my dearest friends, Lisa, makes a card EVERY year, and I anticipate and cherish each one, especially because she hand delivers them. I feel so loved. My husband takes me to dinner and always has an incredible bouquet of flowers waiting at the table when we arrive. I notice that people are curious and look to see who the special person might be that finally arrives. I feel so very blessed. Here's a close-up of one beautiful rose in the large arrangement waiting for me. I went from unloved and homeless to one happy gal. My faith has brought me a long way from those sad childhood days. I have learned to love, be loved, be a mom, wife, friend and the most awesome Mimi (grandma). That is a miracle, don't you think? That's why I'm so freakin blessed! I got this "birthday card" from Anthropologie. I thought it was so creative...I had to show you. Isn't it adorable? I somehow want to contact the Anthro people and personally thank them for their creativity. So to all of you, thanks so much for your kudos. You keep me going! Hugs and kisses. What a wonderful story! God is so good to take our lives and make beauty from ashes. Sharing your life will be a help and encouragement to many. I love the new line! Fabric market is not in the cards this year for me(boohoo),but i do plan to go in the future (ASAP!). I will, however, be looking for your fabric swatches to show up on Michael Miller's website so I can place an order for my shop. I just love those colorful animals prints. Very cool! 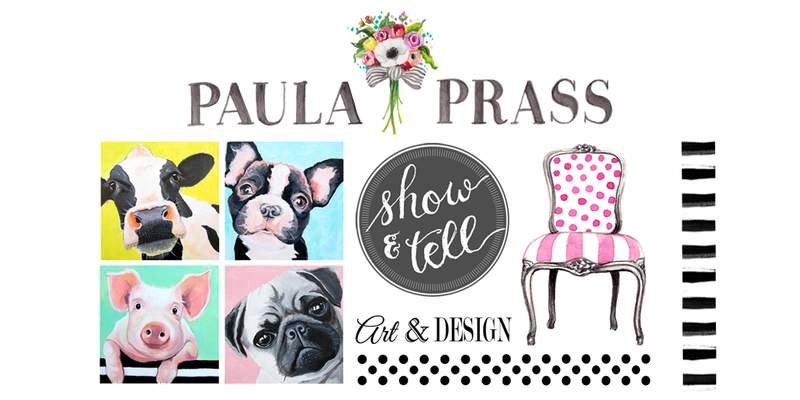 Thanks so much for sharing your story, Paula, and letting us into a more personal side of you! Happy Belated Birthday! Such a touching story of how God has worked in your life. You are such an inspiration to me! Sue, is that you. How fun. Hey, email me and let's get caught up! What's with being anonymous? Join Blogger. I'm now Twittering...who knew? Thanks everyone. It's pretty scary to put yourself out there, so I appreciate your positive comments. What a wonderful story, Paula! Thanks for sharing and for being so inspiring! Belated Happy Birthday to you! ps . . . LOVE the patchwork with the new fabric! Paula - what a wonderful post. Such inspiring gratitude. You are most certainly not alone in childhood-that-doesn't-break-you-makes-you-stronger category. But you are incredibly brave to share with your readers. I for one am so glad to follow your successes here and on Twitter. Happy birthday! I'm excited about your new collection! Happy Birthday, Paula- how inspiring you are. Happy belated birthday to you Paula! I am loving your new fabrics too. Such beautiful, beautiful fabric. I really can't wait to get my hands on some. I'm hoping it will show up in stores not long after market. Yes? Happy birthday Paula. I did not know that about your childhood. Makes it all the sweeter to know how successful you are. As a mother. As a wife. As a designer. Congratulations! Once again I am amazed at God's goodness. My eyes started tearing up when I read the word "unlovable" because you are one of the most lovable people I have ever met and I never would have guessed you had gone through such a tough childhood. Joey and I both just adore you. I hope your birthday was wonderful and I can't wait to get together again in Pittsburgh. I hope our rooms are near each other! Happy Birthday! Thank you so much for sharing your inspirational story. I know it isn't always easy to share the most personal of stories but sometimes it is important because if you offered hope to even one person who is feeling unloved and unwanted and showed them that things can change, well, then you've made a difference in someone else's life, too! 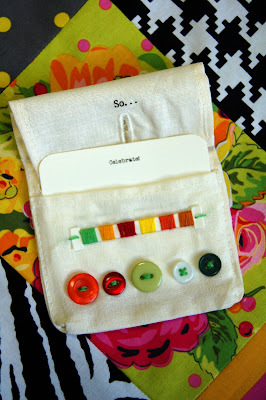 You're a wonderful designer & blogger and I love seeing what you can do! Thanks for sharing your inspiring story! You have truly come a long way. Glad to hear you had a happy birthday and that your husband knows how to spoil you just right! Happy Birthday! So many have broken homes, I think it's so wonderful you have chosen to be successful at everything you do anyways. You are admired by many. Congratulations on your new line of fabric, I love it. Ok, make me cry! Aren't you glad that God rejoices over you with singing? Zephaniah 3:17. I'm amazed at the creativity that God gifted you with. The new fabric is amazing!!! Happy, Happy Birthday! Glad you had such a wonderful day! Happy birthday Paula! Hope it was wonderful! Happy Birthday to you! What an amazing story...I'm not sure how I stumbled upon your blog, but am impressed with your story and your strength! And, your fabrics are terrific! Yay you! Happy Birthday! I'm so glad that you have such a wonderful man that completely soils you every year to let you know how special you really are. I love the new fabric line, I'm excited for when it comes out. Wow! Quite the story to your life! Well Paula you are amazing, I can't imagine anyone not wanting to soak up every bit of time they could with you! Happy Belated!!! Happy Birthday! I am so glad you get to celebrate in a way you truly deserve! BTW, the new collection is AMAZING! I'm always so impressed by those who thrive in spite of their "beginnings." It shows a determination of spirit that is truly remarkable. You are an inspiration to so many. I made a tote from your "Flights of Fancy" line today. I'll post it tomorrow on my blog. That's one of my favorite lines of all time. Truly. Happy Birthday Paula. Your story really touched me. I love that you are so positive and sweet after all that you've been through. You are truly an inspiration. 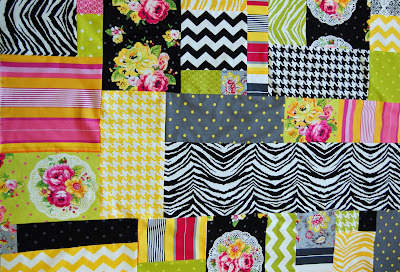 I love the new quilt your working on (and your new fabrics!). 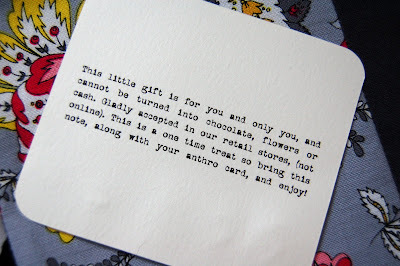 And that little card from Anthro is too cute for words. I've never seen that before! What a darling gift. Sounds like your birthday was simply perfect! You deserve it all!!! Happy Happy Birthday wishes to you! It was so wonderful of you to share your story with all of us. Following your blog and reading what you have written over the last several months, the thought that you were ever unlovable does not even seem possible to me. I often think that when I think of the people I know who had very difficult lonely childhoods, it was never the children who were unlovable but that loving was beyond the capacity of their caregivers. Your kindness and warmth and generous spirit you show here with your words and talents- that is a pretty loveable person to me. Wow...I am so sorry your childhood was so lonely! A very happy belated birthday to you! You don't know me, but I know you a little bit from this here blog of yours....I will be at Market, and I will try to find you and wish you Another Happy Birthday there!! Happy Birthday...mine was on the 18th! Happy Late Birthday!! After your sweet comment on my blog, I thought I would check you out, also! WOW - you are so creative! 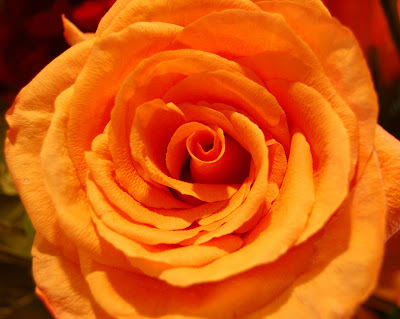 Your blog is full of gorgeous, inspiring colors and posts!! I am adding you to my Google reader! And I can't wait to get my hands on some of your fabric! happy happy birthday!! can we celebrate belatedly in Pittsburgh? Patty's is May 15th! I'll bring a cake LOL! Love all the gorgeous fabric you have been creating to share with us. Thank you for making our world brighter and more beautiful! Found you through QuiltHome.com. Your story really touched me. So glad you have such a beautiful life now! OMG - I had a psycho mother and didn't find out what my real birthday was until about 10 years ago! It totally screwed up my zodiac sign and I was crushed to know that I had been reading the wrong horoscope all of those years. We really do need to meet - we probably have much more in common! what an amazing story you have! May God continue to brighten and bless your days!! You deserve it! !